(Phys.org) -- Researchers in Spain have succeeded in building a photodetector that is a billion times more sensitive than other such detectors based on graphene and could herald the use of graphene based light sensors and solar cells. The team, from the Institut de Ciencies Fotoniques, in Barcelona, describe their research and results in a paper theyve published in the journal Nature Nanotechnology. Starting with the idea that graphene, the notorious single carbon atom thick wonder material, should make a good photodetector, the team reasoned that all that was needed was a means of forcing more light absorption, the only part of the light sensing process that graphene doesnt do well (it is just 3% efficient). To help, the researchers turned to quantum dots, which are nanoscale size crystals that have the unique property of absorbing different wavelengths of light depending on their size. In essence, photodetectors are nothing more than devices that convert small amounts of light into very small amounts of electricity. That electricity can then be measured to determine how much light has been striking the device or used directly to cause other action, such as assisting in producing photographic images. To build their photodector, the team first created a graphene substrate using the standard graphite sticky tape procedure, to which they affixed tiny gold electrodes using nanoscale lithography. Following that, they applied lead sulphide crystals to their device via a spray bottle. Because the crystals werent filtered, they came in a variety of sizes, which accounted for virtually all of the different wavelengths of light. After that, all that was needed was to shine different wavelengths of light onto their photodetector and measure resistance and the amount of electricity produced using the electrodes. They note that it took some effort to find just the right combination of materials when making the quantum dots to ensure maximum ligand exchange between the dots and the graphene to allow for the efficient exchange of charge carriers. After testing and tuning the team found that they were able to achieve 25% internal quantum efficiency. Because of their results, the team believes that new devices based on their photodetector could be built, such as digital cameras, night vision goggles or many other sensing applications. They next plan to build a bigger detector to determine the feasibility of scaling their detector to real world application sizes. 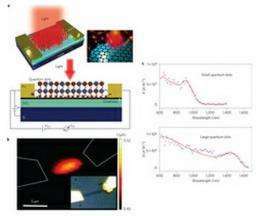 Graphene is an attractive material for optoelectronics and photodetection applications because it offers a broad spectral bandwidth and fast response times. However, weak light absorption and the absence of a gain mechanism that can generate multiple charge carriers from one incident photon have limited the responsivity of graphene-based photodetectors to ~10−2 A W−1. Here, we demonstrate a gain of ~108 electrons per photon and a responsivity of ~10^7 A W−1 in a hybrid photodetector that consists of monolayer or bilayer graphene covered with a thin film of colloidal quantum dots. Strong and tunable light absorption in the quantum-dot layer creates electric charges that are transferred to the graphene, where they recirculate many times due to the high charge mobility of graphene and long trapped-charge lifetimes in the quantum-dot layer. The device, with a specific detectivity of 7 × 10^13 Jones, benefits from gate-tunable sensitivity and speed, spectral selectivity from the short-wavelength infrared to the visible, and compatibility with current circuit technologies. Don't forget applications in astronomy. A billion times more sensitivity would boost the power of every telescope. Yep, the wording was misleading. I seem to recall articles about how we are already technically capable of collecting NEARLY every photon there is to collect from a very distant source, and then using math to calculate what photons might look like to fill in the gaps between the ones we see. For any given size lense, there is an absolute limit to the number of photons received. Once you reach near 100%, a billion times more sensitive than that doesn't help much. Maybe even more so for very small objects, since we can already see objects at the limit of what you can see with photons, and have moved on to methods that do not use photons.